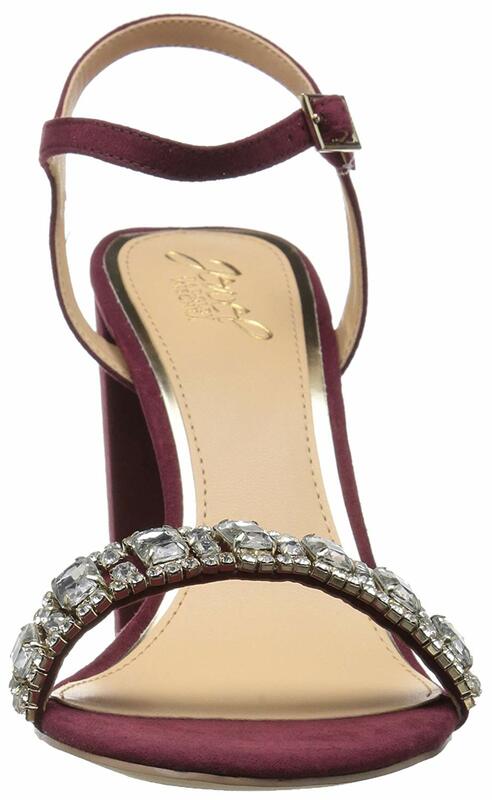 Stone top band adjustable ankle strap sandal "Since joining forces in 1988, Mark Badgley and James Mischka have made a markfor the pasttwo decades with their gorgeous, glamorous and stylish footwear, evening wear and accessories that are highly coveted among Hollywood A-Listers and fashionable Hollywood stars. Badgley Mischka shoes are the perfect evening shoes for any woman that wants to feel and look like a princess. Badgley Mischka shoes are perfect forthe bride-to-be, bridesmaids, the mother of the bride and any woman who wants to feel glamorouson any given night out in the city, at her wedding, prom or to wear for aspecial occasion. Here you can shop our latest Badgley Mischkafootwearcollection including intricately designed crystal embellished satin and silk shoes, beautiful peep-toe lace pumps in black, beige and white, gorgeous metallic dress pumps and dress sandals to complement your beautiful evening and cocktail dresses, crystal embellished fashion slip-on sneakers, high heel embellished mules, metallic wedges, ankle strap high heels, strappy jeweled embellished sandals and pointy toe metallic satin pumps to dress up any outfit. In our store you will find a large selection of Badgley Mischka gorgeous shoes in every size and color to wear with your beautiful going out and party outfits. / Buy with confidence! BADGLEY MISCHKA Womens footwear would make a great addition to your shoe collection!